ESCHATOLOGIA: Is an Eclipse a Sign of the End Times? Eclipses and “blood moons” seem to especially stoke end-times hysteria. 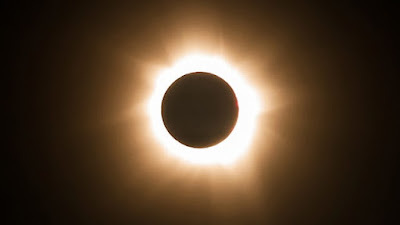 Some point to Matthew 24:29 as connecting a solar eclipse with the end times: “Immediately after the tribulation of those days the sun will be darkened, and the moon will not give its light” (ESV; see also Isaiah 13:10). During a solar eclipse, the sun is significantly darkened and the light normally reflected by the moon is gone. Also, during a lunar eclipse, the light normal reflected by the moon significantly decreases. So, yes, there does seem to be a possible connection between an eclipse and the end times. With that said, there is no way to connect a specific eclipse with the fulfillment of end-times prophecy. Eclipses are actually quite common, with a total solar eclipse occurring somewhere on Earth approximately once every 18 months. Partial solar eclipses occur several times per year. Total lunar eclipses occur virtually every year in most parts of the world. Since the time that Jesus spoke the words recorded in Matthew 24, there have been thousands of total and partial, solar and lunar eclipses. None of them seem to have had any significance to end-times Bible prophecy. So, there is no way to know a particular eclipse in the future will have a connection to the end times. Also, it is important to look at the rest of what Jesus says in Matthew 24, which is known as the Olivet Discourse. The possible eclipse is just one of several signs that Jesus mentions. Here is the whole of verse 29: “Immediately after the distress of those days ‘the sun will be darkened, and the moon will not give its light; the stars will fall from the sky, and the heavenly bodies will be shaken.’” People pick up on the dark sun and moon, but they tend to ignore the stars falling and the planets shaking. Also, Jesus specifies that this sign will come “immediately after the distress,” a reference to the abomination of desolation in verse 15. This will be a time when “there will be great distress, unequaled from the beginning of the world until now—and never to be equaled again” (verse 21). In fact, so terrible is that time that, “if those days had not been cut short, no one would survive” (verse 22). This is no regular eclipse that Jesus speaks of but one that occurs in the middle of the tribulation with a multitude of other signs. It will be the worst time of trouble the world has ever seen. It is important to remember that Jesus said no one knows the day or hour of His return (Matthew 24:36). Since eclipses can be pinpointed to the very second, it would seem an eclipse cannot be the precise moment of Christ’s return. Our curiosity about when the rapture will occur, who the Antichrist will be, when the tribulation begins, and what exactly the abomination of desolation is must remain unsatisfied for now. The apostle Peter gives us practical instruction in light of the end times: “You ought to live holy and godly lives as you look forward to the day of God and speed its coming. That day will bring about the destruction of the heavens by fire, and the elements will melt in the heat” (2 Peter 3:11–12). We know that we will then see the new creation, “where righteousness dwells” (verse 13). Living our lives in light of Christ’s return means living in holiness and anticipation. Trying to calculate the timing of end-times events based on astronomical phenomena is not something the Bible calls us to do.